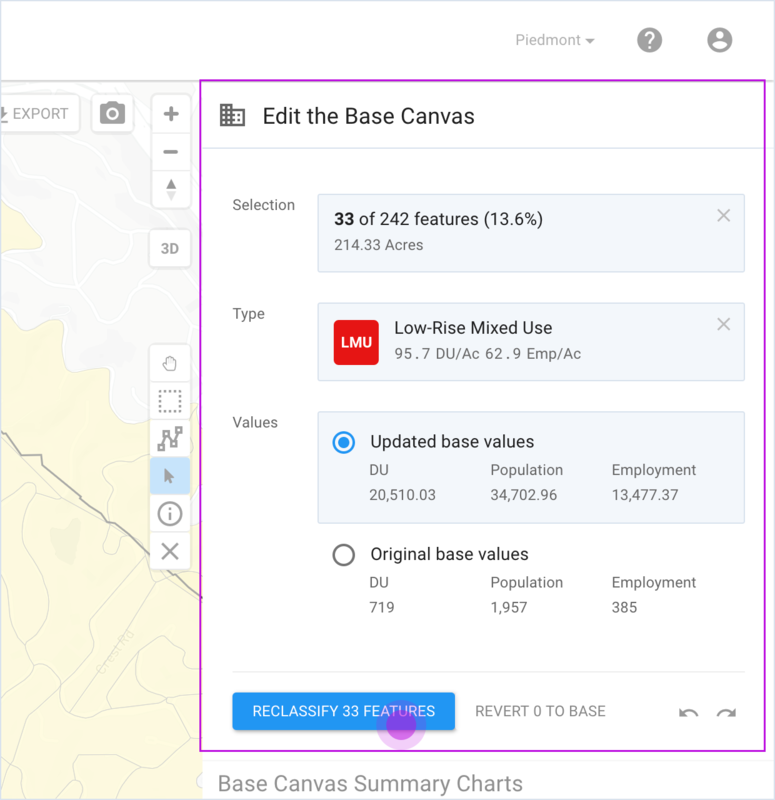 Base canvas editing enables you to easily update UrbanFootprint’s land use canvas so that your project reflects local knowledge and supplementary data sources. 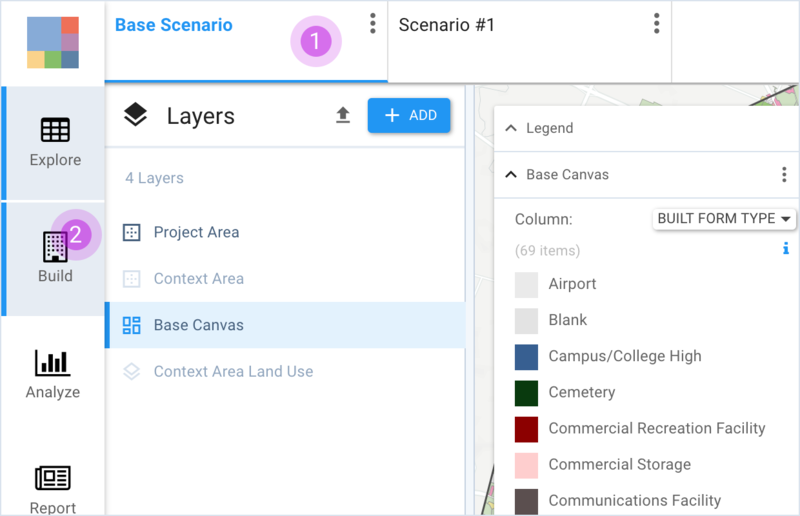 UrbanFootprint will recalculate and update project area totals and even make updates to existing scenarios to reflect changes to the existing land use base canvas. Make sure you have selected the Base Scenario. Click on “Build” in the left hand Modes Bar. Clicking on Build will activate the Base “Canvas” for the scenario (highlight it in blue). A layer must be activated to select features (geometries) in it. It will also open the right-hand Build pane. Selection: A summary of the currently selected features, including a features count and the sum of acres in selected parcels or blocks. Type: Menus of available Place or Building Types. Reclassify: Button used to deploy Place or Building Types on to selected geometries. Revert: To wipe away any changes made to selected features and reset it to the original Type and values, use Revert to Original. Undo / Redo: Arrow buttons that undo or redo Reclassify actions. Once one or more features are selected, the Build pane will summarize the selection. To open a Type palette: Click the Building or Place Type button in the Build pane. To select a Type, click on it. To view a summary of key attributes for a Type (beyond the dwelling unit and employee densities per acre), click on the expand arrow. 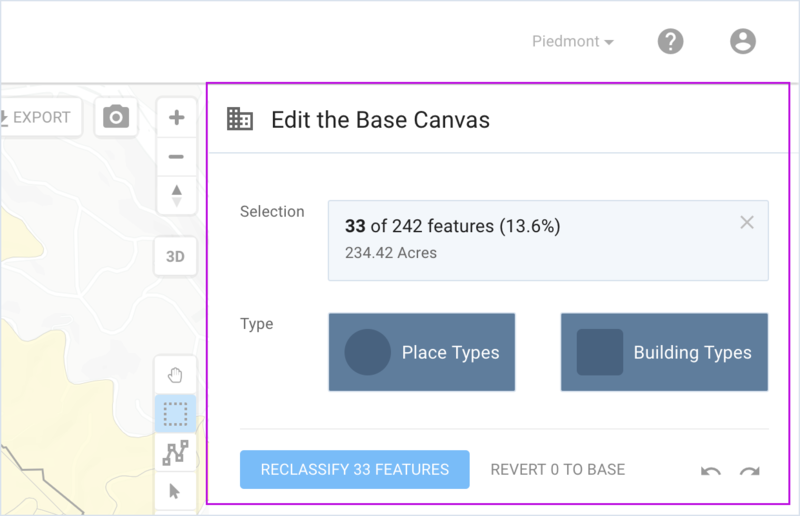 Once you have selected features on the map and a Building or Place Type, you will be given the option to update data values when reclassifying, or leave the values as they are. Updated base values (default): This is the more common choice. Reclassification changes the current Building or Place Type assigned to a feature. “Updating base values” modifies the underlying data at the same time (population, dwelling units, employees, and building area). To Reclassify, click the blue RECLASSIFY button (you can always undo it later). Because editing the Base Canvas can have far reaching impacts on a project (e.g. it will update all scenarios automatically and likely require updating analysis module results), you will be asked to confirm reclassification every time you click the reclassify button. Click Reclassify to complete the reclassification. In most cases, scenario updates will cause analysis results to be ‘out-of-date.’ Modules must be re-run manually. Sometimes you will want to clear past Reclassify actions by directly selecting features (parcels or blocks) on the map. Unlike the undo button, which rolls back Reclassify actions chronologically, Revert to Base allows you restore the original base by making targeted selections. 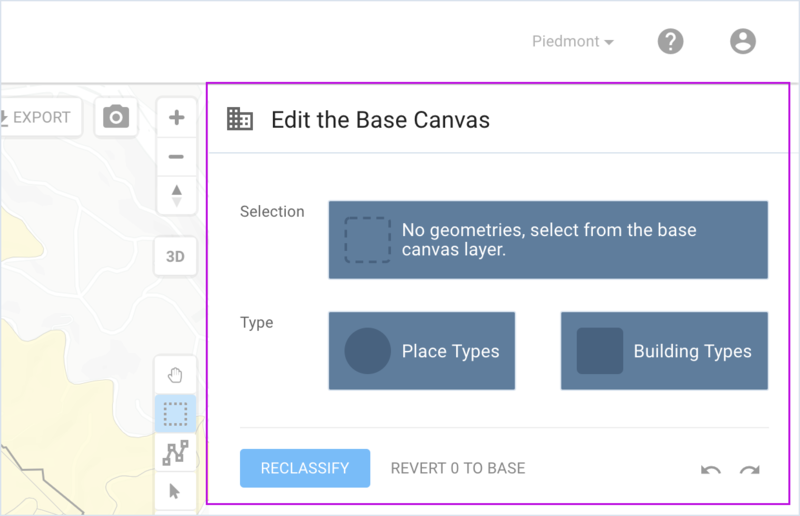 Select any features on the map that you want to revert to the original base values and click the Revert to Original button. This will reset the features to the original base values.